Mahishyas , the weavers of Midnapore in the southern corner of West Bengal are skilled at weaving the most popular mats Madur. Weavers weave this on an uncomplicated frame loom made out of bamboo. Warp is of cotton thread and the weft is a thin soft reed known as madur kathi. 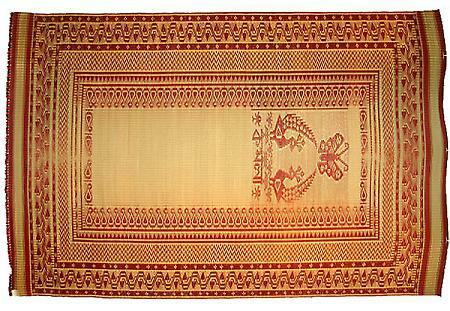 Midnapore craftsmen design three types of madur mats. These are ek- rokha,do- rakha ?as they are light madur kathi weft. Do- rakha is thicker than the ek- rakha and is more suitable and comfortable when compared to ek- rakha. These mats can be carried anywhere. Masland is a textured mat on which the craftsperson designs geometrical designs on both the borders. These designs are self in colour but sometimes they are painted in the shade of magenta. The crafts-persons at West Bengal design plaited or coiled baskets .The warp as well as the weft are made to intermingle in assorted ways. Twill kind of design is obtained when the each weft passes over two warps and which goes under two. Single weft passed leads to a check effect which can be done only by the magic hands of a skilled crafts-person. Coiled baskets are made with a tall flowering grass called Keshe or Kash. Bsketry craft is carried from one generation to the other. Palmyra leafs which are in the shape of fan are made into mats or locally called chatais . Palm leaf mats are very beautifully designed at IIamhaza in Birbhum district by the women folks belonging to the Muslim community. These mats have colorful geometrical designs in shades of Green, blue and magenta. Village Sarta, P.S. Sabang. Dist: Pashim Midnapur, West Bengal.